Irrigation – the process of artificially applying water to plants – has been in practice since as early as 6000 BC. There have been many advances in irrigation since then, and today’s technologies have made it easier than ever to control water flow as well as fertilizers, nutrients, and other chemicals. Irrigation control is a technique used to manage an irrigation system. Irrigation control systems manage electric valves that regulate the flow of water through piping systems. Automatic irrigation controllers allow water to flow to specific crops, or zones, based on a triggers such as time, soil conditions, solar radiation accumulation, environmental controls, and other algorithms. 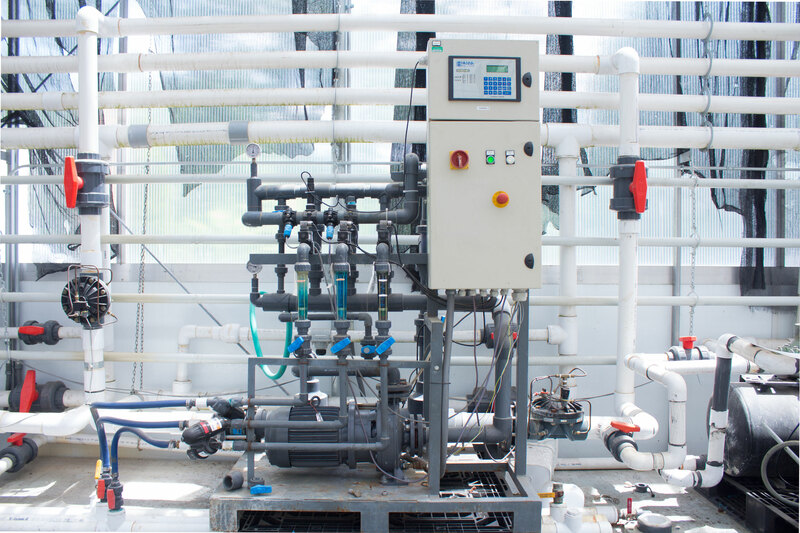 This type of automation can be complex, since water must be applied to plants in specific volumes over varying amounts of time. Fertigation is the process of running fertilizer through irrigation water. The practice of running plant nutrients through irrigation systems has increased dramatically over the last 20 years. As careful water management and sustainability become more common issues, the need for high yields of superior-quality crops has increased. Because of this, more growers are exploring the advantages of combining their water and fertilizer applications. Fertigation increases efficiency by delivering water and nutrients directly into the root zone, where they’re most needed. This results in the need for less fertilizer and water. Other potential advantages of fertigation include flexibility, saving on labor and energy costs, and the ability to add nutrients that may be otherwise difficult to apply. 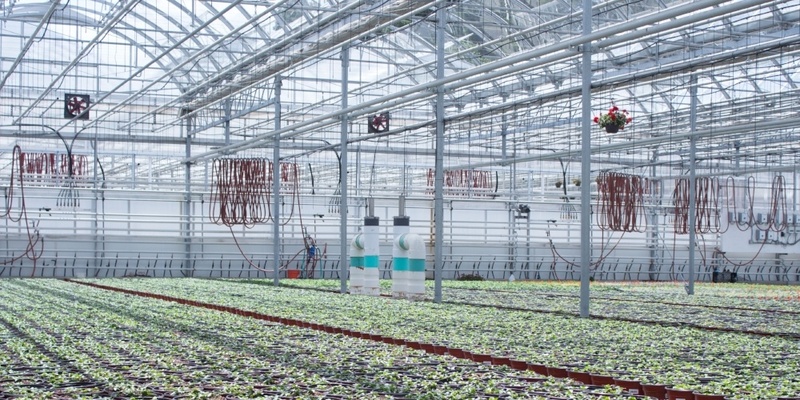 Properly automated commercial greenhouses, hydroponics operations, and agricultural fields will reduce their costs for chemicals and labor while increasing crop yields and health. Hanna has three customizable options to fit any size facility. The Hanna HI10000 Fertilizer Injection System can accommodate flow rates from 1 gallon per minute (GPM) to 350 GPM (or 5 GPM-750 GPM with an expanded manifold) while the HI5000 and HI2500 are available for growers with smaller operations. This level of flexibility coupled with remote access allows the entire fertigation process to be monitored and controlled from anywhere in the world, saving you time and giving you more freedom. Fertilizers have been applied through a wide range of irrigation systems for many years and are the most commonly injected chemicals. Many of the older methods required significant worker contact and trial-and-error techniques. With the introduction of better technology, applying pesticides has become more wide spread as a necessary compliment to fertilizer injection. 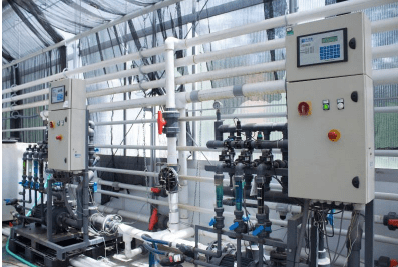 Drip and micro-irrigation, prevalent in greenhouses and hydroponic environments, have a characteristic not shared by other irrigation methods; fertigation is not an option but is actually necessary. Fertigation provides the only truly efficient way to apply fertilizers physically to the crop root zone. On high value crops, such as lettuce, tomatoes, and commercially produced potted plants, the level of fertigation management for achieving high yields and qualities exceed what is found with other irrigation methods. Volumetric injectors take a small portion of concentrated fertilizer solution from a stock tank and inject it into the water line. For every part of stock solution in the system, there are x parts of water, where x is determined by the injector ratio. For example, with a 1:100 ratio, one part of stock solution is mixed with 99 parts of water, for a total of 100 parts of final solution. The size of the stock tank varies, and it could be as small as five gallons or as large as 2,000 gallons. Often ratios are expressed as percent. For example, a 1:100 ratio equals a 1% solution. Volumetric injectors have been used successfully for a very long time; the technology is old but reliable. However, most injectors are flow driven and don’t take into account the actual chemistry of the irrigation water. In essence they are blind to the actual concentrations of the various fertilizers being injected. Electrical conductivity (EC) is a measure of a solution’s ability to conduct an electrical current. The conductivity of a solution is largely dependent on the concentration of TDS in it. The relationship between ppm, TDS and EC is usually a factor between 0.65 and 0.7, depending on your fertilizer formulation. With a 0.65 factor, a reading of 1 milliSiemen/centimeter (mS/cm) would equal 650 ppm TDS. 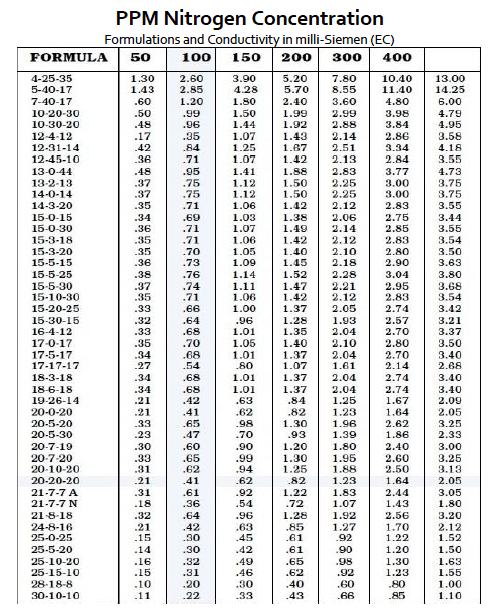 Most growers use the EC reading exclusively as charted below. Most soluble fertilizers, when dissolved in the irrigation stream, produce an EC reading that’s directly proportional to the concentration of fertilizer present and is expressed as ppm nitrogen. Fertigation driven by EC measurements lets growers manage crop nutrients at a level that’s nearly impossible to achieve with conventional volumetric practices. The results can include higher yields and better crop quality. Even just a 10% increase in production will translate to increased profits, higher energy efficiency, and more money saved. Acids have been and always will be an excellent tool for growers. Acids help you gain better control of your irrigation water’s alkalinity (mostly bicarbonates and carbonates), as well as the pH of your growing media. Once the role of alkalinity is understood, you may consider the following step to control alkalinity using acids through your injector system. The most commonly available acids are phosphoric, sulfuric, nitric, and citric. The most effective and widely used acid is sulfuric acid; however, this is also one of the most hazardous. Each type of acid has its pros and cons. For low amounts of alkalinity removal, phosphoric acid may be your acid of choice. However, you need to be careful when using this acid because phosphorus levels will increase. Nitric acid is theoretically ideal because it adds nitrate nitrogen, but it fumes and is highly oxidizing, making it very difficult to handle. Citric acid is a weak organic acid and a solid, making it safer than the other three; but it is much less effective, and therefore more expensive to use. Once you choose an acid to use, make sure your injector can handle the task. Not only is it important that the materials be acid resistant, the controller must be able to accurately control and maintain a fixed pH over a wide flow range. Over 200 Hanna Fertigator systems have been installed across the United States since 2005. 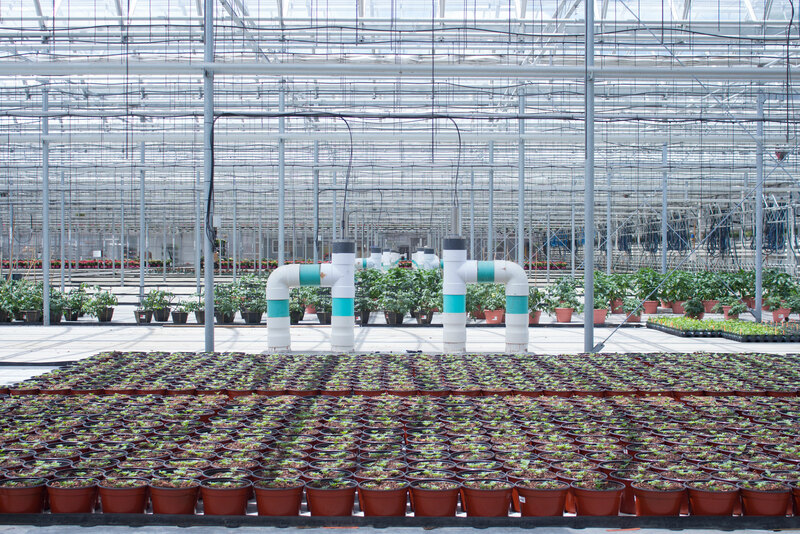 Many of these units have been in service for over ten years, with their range of applications spanning hydroponics, living walls, commercial potted plant producers, and high tech growing facilities. The Hanna HI10000 Fertilizer Injection System precisely monitors and controls fertilizer concentrations and pH for all types of hydroponics, greenhouse, and field agricultural applications. The HI10000 is also a complete irrigation control system with 32 valve (zone) capabilities. Unlike flow-driven systems of the past, the Hanna Fertigation System continuously measures the actual EC and pH of the flow-through, and precisely adjusts the concentration of fertilizer into the system. The Hanna Fertigation System is a bypass system which will not interfere with your main line flow, and therefore does not impede line flow or pressure.